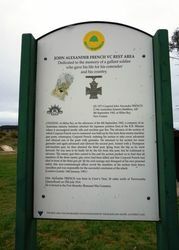 A rest area commemorates John French who was awarded the Victoria Cross (V.C.) during World War Two. 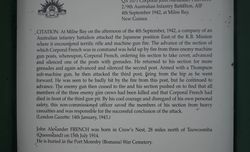 At 4pm on September 4 1942, ‘B’ Company of the 2/9th battalion of which Corporal French was a member, encountered heavy Japanese fire at Milne Bay. After ordering his section to take cover, John bravely wiped out two Japanese gun posts. As he advanced on the third however, he was hit with a barrage of bullets and fatally wounded but not before killing all of the three Japanese gun crews and successfully concluding the attack. John French was awarded the British Commonwealth’s highest award for gallantry, the Victoria Cross. CITATION : At Milne Bay on the afternoon of the 4th September, 1942, a company of an Australian infantry battalion attacked a Japanese position east of the K. B. 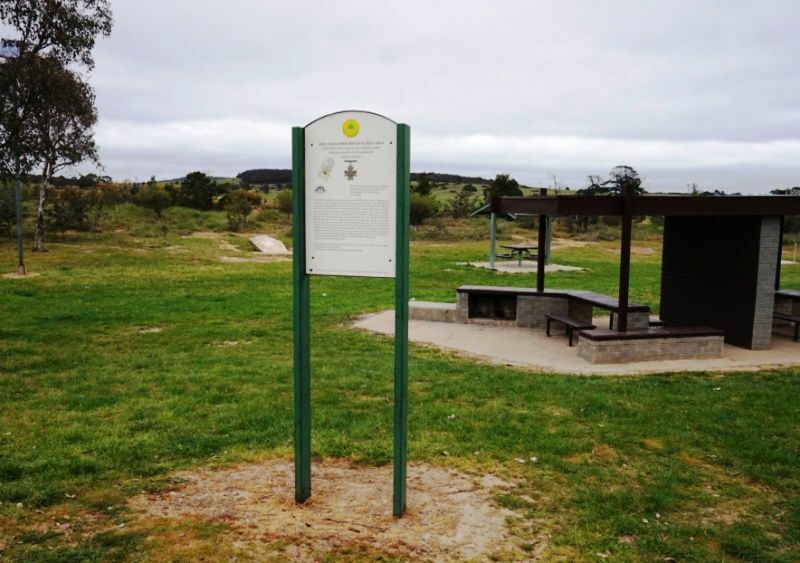 Mission where it encountered terrific rifle and machine gun fire. The advance of the section of which Corporal French was in command was held up by fire from three enemy machine gun posts, whereupon, Corporal French, ordering his section to take cover, advanced and silenced one of the posts with grenades. He returned to his section for more grenades and again advanced and silenced the second post. Armed with a Thompson sub-machine gun, he then attacked the third post, firing from the hip as he went forward. He was seen to be badly hit by the fire from this post, but he continued to advance. The enemy gun then ceased to fire and his section pushed on to find that all members of the three enemy gun crews had been killed and that Corporal French had died in front of the third gun pit. By his cool courage and disregard of his own personal safety, this non-commissioned officer saved the members of his section from heavy casualties and was responsible for the successful conclusion of the attack. 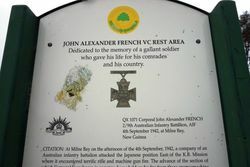 John Alexander French was born in Crow`s Nest, 28 miles north of Toowoomba (queensland) on 15th July 1914. He is buried in the Port Moresby (Bomana) War Cemetery.